Graph algorithms provide the means to understand, model and predict complicated dynamics such as the flow of resources or information, the pathways through which contagions or network failures spread, and the influences on and resiliency of groups. 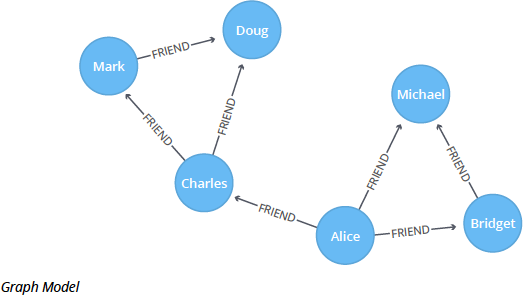 This blog series is designed to help you better utilize graph analytics and graph algorithms so you can effectively innovate and develop intelligent solutions faster using a graph database like Neo4j. Last week we continued our focus on Community Detection algorithms, with a look at the Label Propagation algorithm. 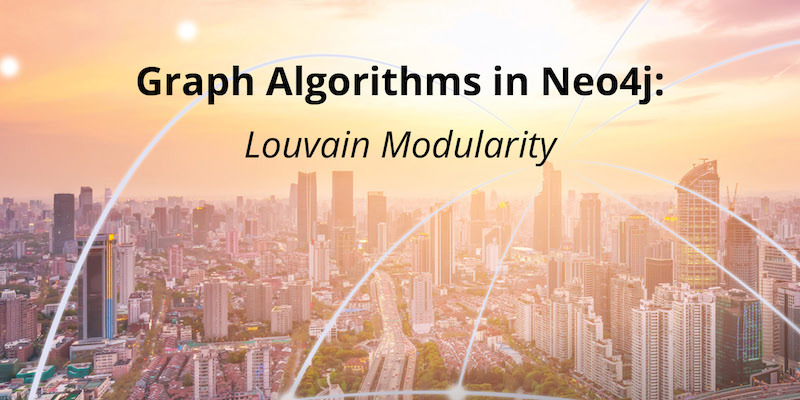 This week we continue our exploration of Community Detection algorithms, with a look at the Louvain Modularity algorithm, which measures the quality (i.e., presumed accuracy) of a community grouping by comparing its relationship density to a suitably defined random network. The Louvain method of community detection is an algorithm for detecting communities in networks. 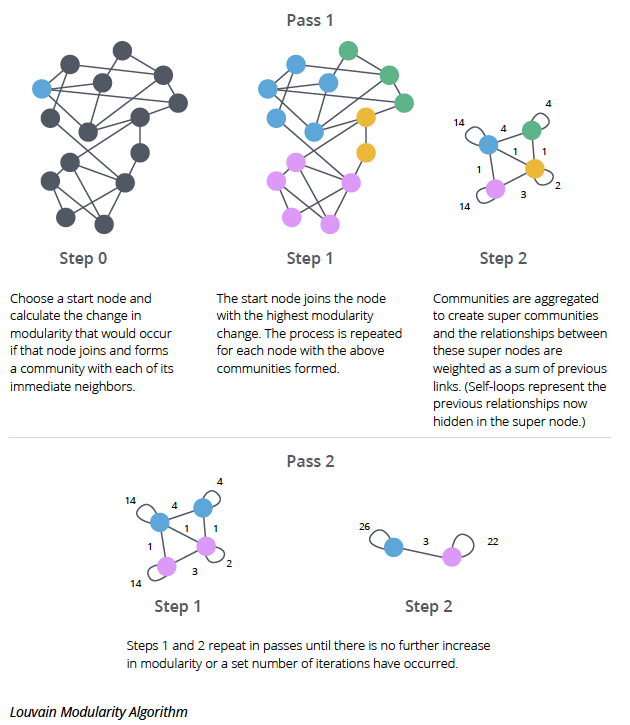 It maximizes a modularity score for each community, where the modularity quantifies the quality of an assignment of nodes to communities by evaluating how much more densely connected the nodes within a community are, compared to how connected they would be in a random network. 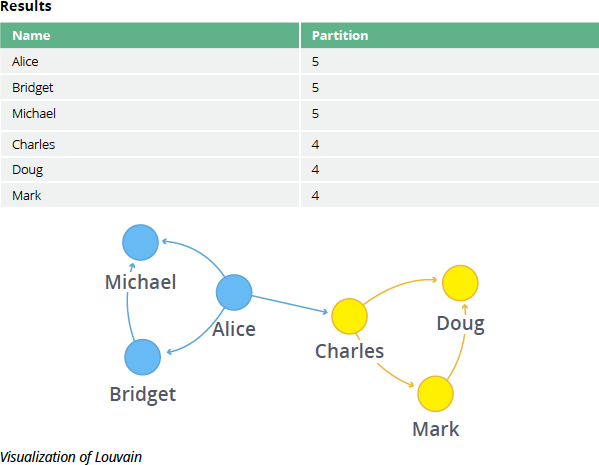 The Louvain algorithm is one of the fastest modularity-based algorithms and works well with large graphs. It also reveals a hierarchy of communities at different scales, which is useful for understanding the global functioning of a network. In order to understand the Louvain modularity algorithm, we must first look at modularity in general. Modularity is a measure of how well groups have been partitioned into clusters. It compares the relationships in a cluster compared to what would be expected for a random (or other baseline) number of connections. The Louvain algorithm was proposed in 2008. The method consists of repeated application of two steps. The first step is a “greedy” assignment of nodes to communities, favoring local optimizations of modularity. The second step is the definition of a new coarse-grained network based on the communities found in the first step. These two steps are repeated until no further modularity-increasing reassignments of communities are possible. When Should I Use Louvain? The Louvain method has been used to investigate the human brain and find hierarchical community structures within the brain’s functional network. 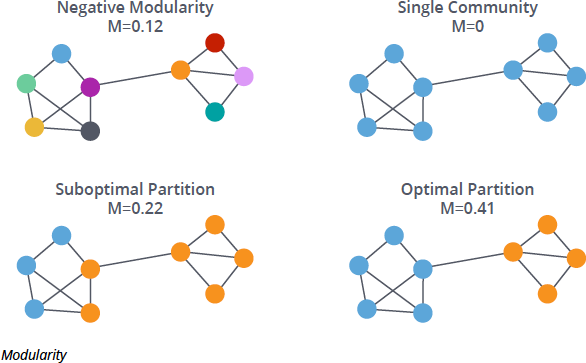 The study mentioned is Hierarchical Modularity in Human Brain Functional Networks. For larger networks, the Louvain method doesn’t stop with the “intuitive” communities. Instead, there’s a second pass through the community modification and coarse-graining stages, in which several of the intuitive communities are merged together. This is a general problem with modularity optimization algorithms; they have trouble detecting small communities in large networks. It’s a virtue of the Louvain method that something close to the intuitive community structure is available as an intermediate step in the process. Our algorithm found two communities with three members each. Mark, Doug and Charles are all friends with each other, as are Bridget, Alice and Michael. Charles is the only one who has friends in both communities, but he has more in community four so he fits better in that one. As we’ve seen, the Louvain Modularity algorithm is used to evaluate social structures in Twitter, LinkedIn and YouTube. It’s also used in fraud analytics to evaluate whether a group has just a few bad behaviors or is acting as a fraud ring, which would be indicated by a higher relationship density than average. Next week we’ll continue our focus on Community Detection algorithms, with a look at the Triangle Count and Average Clustering Coefficient algorithm. Mark Needham is a Support Engineer for Neo4j. He also blogs about software development at markhneedham.com. Amy is the Analytics and AI Program Manager at Neo4j. 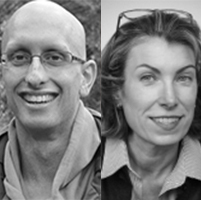 She believes a thriving graph ecosystem is essential to catalyze new types of insights. Accordingly, she helps ensure Neo4j partners are successful. In her career, Amy has consistently helped teams break into new markets at startups and large companies including EDS, Microsoft, and Hewlett-Packard (HP). She most recently comes from Cray Inc., where she was the analytics and artificial intelligence market manager.Amy has a love for science and art with an extreme fascination for complexity science and graph theory. When the weather is good, you’re likely to find her cycling the passes in beautiful Eastern Washington.